We made it in just in time to get breakfast. They closed at 2pm and we got there at 1pm. They said our timing was perfect as it had been a busy morning. From what I’ve read, I kind of assumed that would have been the case. We quickly grabbed a seat and began to peruse the menu. 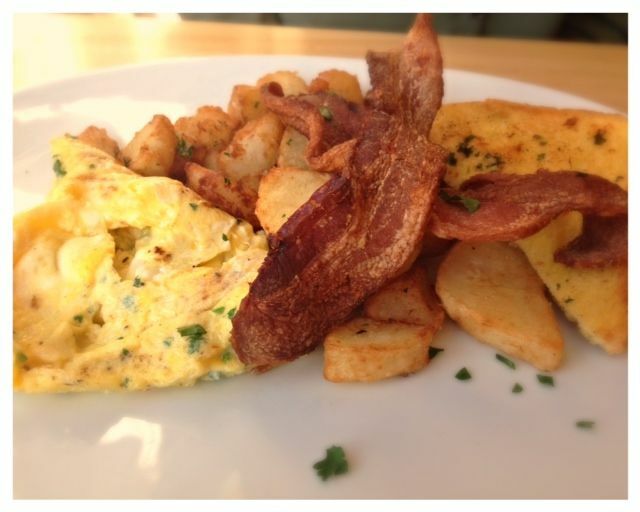 Here’s the thing you need to know about Roost; the breakfast menu is not large and it’s not your typical eggs, bacon and french toast kind of place. It does however have a very creative menu. What caught my attention initially was the Scallion Pancake with Braised Pork and a fried egg. Unfortunately it wasn’t on the menu when I went, but they did have some other great options. 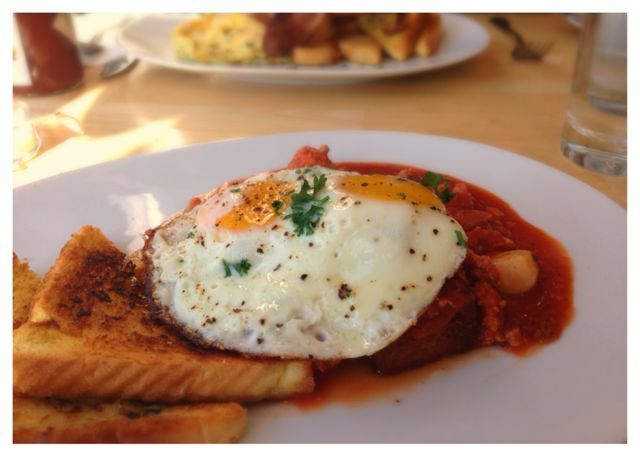 I chose the Fried Polenta Topped with Pork Sausage, Tomato Sauce, Fried Eggs and Griddled Toast. I was a little concerned about the tomato sauce, but figured that since it was really after 1pm, I could go extra savory for this brunch. I do like fried polenta, especially when they get some really crispy pieces to it, which this had. Although this dish was heavy on the tomato sauce, it was really good. Topped with eggs….yum, perfect combo. Very savory, very filling and tons of great flavors going on. The griddled toast was a slice of buttery goodness. 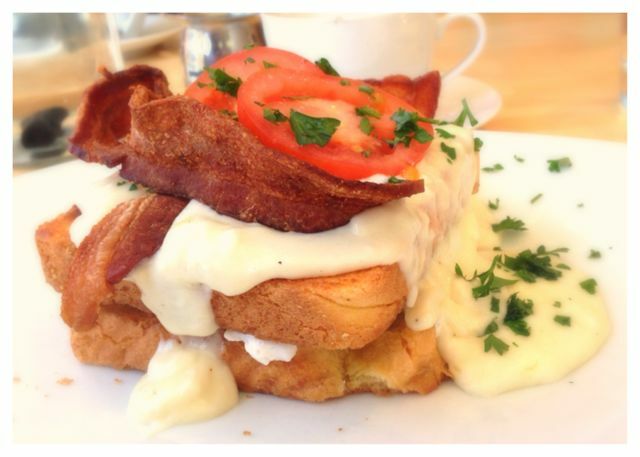 My husband ordered the Kentucky Hot Brown with Griddled Toast. The reason we ordered it is because we saw it come out and it looked impressive. We asked what it was and decided right away to give it a try. 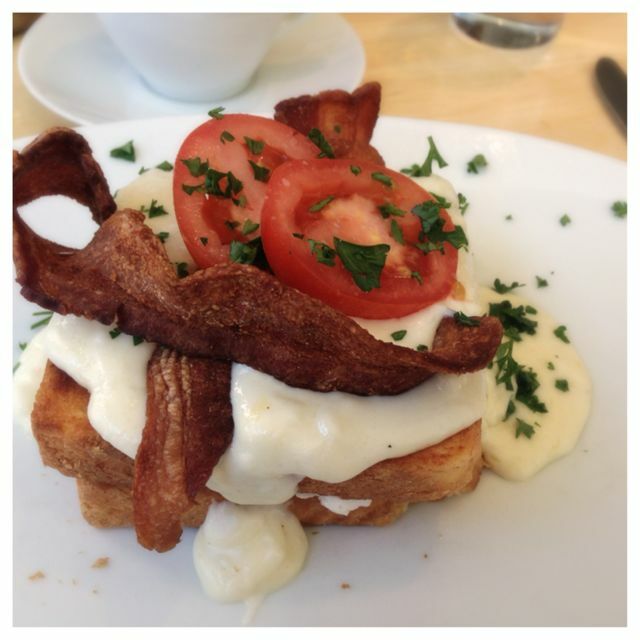 The 2 pieces of griddled toast had a Poached Eggs in between, then the Mornay Sauce, Bacon and Tomato on top. A mornay sauce is a Béchamel sauce with shredded or grated cheese added. Presentation on this dish was spectacular and it tasted just as good. It was a heavy dish because of the Mornay sauce, but still it was good. Keeping with a more traditional breakfast our friends ordered the Eggs, Bacon and Toast plate. Even though this is a safe dish, it was really well done. Their potatoes are super crispy. Had I known I may have ordered a side. 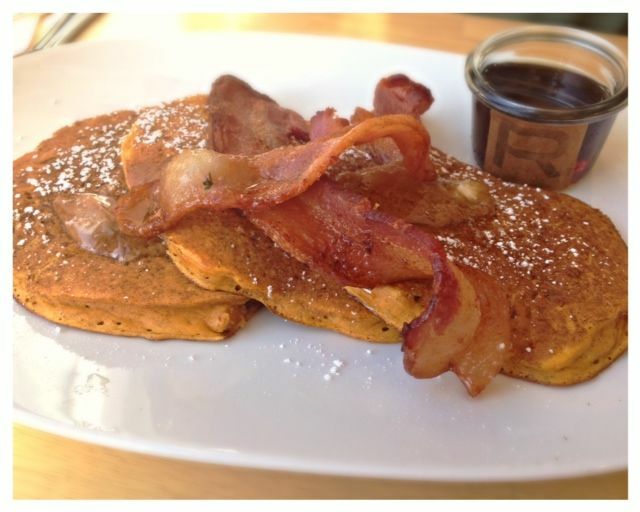 They also chose the seasonal pancakes, which were the pumpkin spice pancakes with Ginger Snap Peanut Butter. They were both completely happy with their meals and said they would even go back. We do plan to go back. I really do want to try their dinner because their deep fried brussels sprouts sound pretty awesome. Atmosphere is a minimalist approach. There was not a lot going on yet the sleek lines were inviting. They space is smaller and there are huge windows, so it would feel good even on a rainy day. Pricing was about $12 a plate. They have some pretty impressive mimosas on the menu, but we didn’t order any. They also had Stumptown coffee and PG Tips tea, which I had never heard of, but it was good. Roost is located on Belmont st.
That first picture is making me crazy!